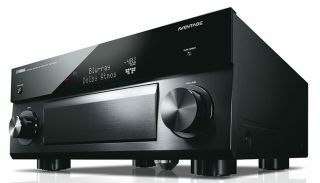 Yamaha announces Aventage RX-A60 series for 2016 | What Hi-Fi? Yamaha’s 2016 range of Aventage AV receivers comprises five models, all of which support Dolby Atmos and DTS:X. Pricing details for the new Aventage series have yet to be announced, but Yamaha says you can expect them to be similar to last year’s models, which started at £550 for the first time. However the entry-level RX-A660 model - new for 2016 - is believed to be more expensive than than the outgoing RX-A550, but will come with a higher spec to compensate. All five receivers can handle 4K Ultra HD as well as HDR and BT.2020, so they are pretty future-proofed. They will also support Dolby Atmos and DTS:X 3D sound formats. The top-of-the-range RX-A3060 (pictured top) gets the added benefit of Cinema DSP HD technology, which adds two channels at the back of the speaker configuration, dedicated to reproducing Cinema DSP effects for added clarity. All models feature Yamaha’s Total Purity Concept circuitry design, which uses fully discrete power amplifiers, independent analogue and digital power supplies and a high-quality volume control integrated circuit. Yamaha’s YPAO room calibration software also features across the range, but the RX-A3060 gets the added benefit of 64-bit and 3D sound processing. The RX-A1060 model and above also get ultra-low-jitter circuitry and high-performance ESS DACs. Connecting to any of the five receivers should be a breeze, as all come with built-in wi-fi and Bluetooth, as well as Bluetooth output for streaming audio to headphones or speakers. The RX-A860 model and above get a phono input and come bundled with Yamaha’s MusicCast multi-room technology. Yamaha says all new models should be released just before IFA in September. We’ll bring you pricing information when we have it.